If you are some how related to sports then you must need good sports flyers for your day to day sports activities. No mater whether you own a sports club or you are a small scale sports academy, you cannot deny importance of advertisement via flyers. I am pretty sure it is not affordable for a small scale sports academy owner to hire a good graphics designer for plenty of hours to design your flyers. I have a free solution of your problem. Here are some good free sports flyers templates for your use. You can freely change these flyers templates for your own needs. This flyer template is best for football related events. For example, if you are going to conduct a local football match then you can use this template to create a flyer for your football match. There is an editable flyer heading on the top of template where you can place you own flyer title like abc sports club, xyz football league etc. Under the main heading there goes a sub heading which will contain your main marketing tag. There is a a big text area in the lower half of the sports flyer in which you can write your football tournament details and any terms and conditions to participate in your football tournament. On the top left side of the flyer there is a small text area which right now contains 2010 in it, you can change it to show current date of year. If you are involved in general sports or you have a miscellaneous sports club and you want to promote your sports club or any upcoming sports even then you can the flyer template bellow. It has a distinctive cool look plus an eye catching color scheme. Put it in a hundred sports flyers and you will find it well outstanding. download the flyer template given bellow. Flyer looks great and is very easy to edit. 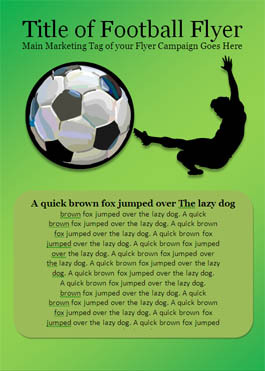 Title of this sports flyer is actually wordart, you just need to double click on it and text edit window will be opened. You can write your own text in place like dashdash sports club. On the top left of this flyer there goes a text area to display flyer publishing date. Currently it is set to 2010 but you can write in full date as well. The theme of this flyer is warm and speedy, I really like the football coming out of flyer title leaving behind fire flames. 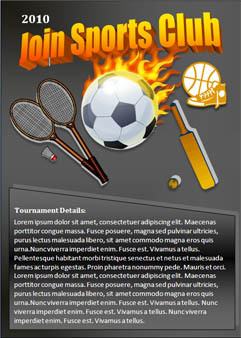 Right now this sports flyer contains cricket bat and ball, badminton rackets and a football with a shoe but you can delete any unwanted image and enlarge the remaining images. For instance if you are going to use this flyer for promotion of cricket then you can remove remaining three images and enlarge bat and ball in the center of the flyer. I am sure you got the general idea.